There are many dykes in the Netherlands, and their structural health must be continuously monitored. Inspecting the condition of dykes and other sea defense structures is typically a task for robots, working in a team and in a highly autonomous way. But if they move around across the dykes, perform tests, and communicate the results for six hours a day, they use a lot of energy. Introducing charging stations is not a realistic scenario. A Dutch researcher had a better idea: an innovative automatic gearbox or the robots, which uses two metal hemispheres instead of a belt drive. Autonomy and unmanned systems experts from across the naval science and technology (S&T) community will converge on the shores of the United Kingdom next month for the first-ever Unmanned Warrior joint exercise hosted by the British Royal Navy. The U.S. Navy contingent will experiment with ten technology projects to push the limits of maritime autonomous systems in real-world, challenging operational environments. A rumbling robot and several high-flying drones recently made an on-site appearance at Clemson University to burrow through and buzz above fifteen acres of experimental sorghum plots containing more than 2,800 replicated entries. The space-age devices are part of a collaborative project with Clemson University and other partners designed to significantly enhance the ease and frequency of data collection for crop testing in ways that will eventually benefit all agricultural production in South Carolina and around the world. After months of planning, building, programming, testing, and tweaking, it all came to down to this one moment — the 19th annual International RoboSub Competition, held in San Diego, California, 25-30 July. Forty-six teams competed in this year’s event. The robotics contest challenges students to design, build and race submarines through a complex obstacle course, where points are awarded for the number and difficulty of successfully completed mission tasks. Researchers have developed the first single actuator wave-like robot (SAW). SAW can climb over obstacles or crawl through unstable terrain like sand, grass, and gravel, reaching a top speed of 22.5 inches. The robot will be useful for traveling through the intestine for imaging and biopsies, and for infiltrating problematic, complex security areas, such as tunnels, destroyed buildings, and pipes. 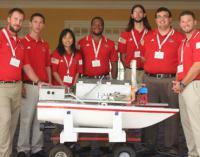 The future of naval engineering was on display earlier this month, as thirteen teams of high school and college students did battle at the ninth annual RoboBoat Competition in Virginia Beach, Virginia. The competition is a robotics contest where teams program their student-built autonomous surface vehicles to navigate through a series of water-based challenges. New technology could lead humans to relinquish control over decisions to use lethal force. As artificial intelligence advances, the possibility that machines could independently select and fire on targets is fast approaching. Fully autonomous weapons, also known as “killer robots,” are quickly moving from the realm of science fiction toward reality. While the process of creating international law is notoriously slow, countries can move quickly to address the threats of fully autonomous weapons. They should seize the opportunity presented by the Convention on Conventional Weapons review conference, to be held this December, because the alternative is unacceptable: Allowing technology to outpace diplomacy would produce dire and unparalleled humanitarian consequences. Hazardous-devices teams from around the Southwest will wrangle their bomb-squad robots at the tenth annual Robot Rodeo beginning Tuesday, 14 June, at Los Alamos National Laboratory. “The Robot Rodeo gives bomb-squad teams the opportunity to practice and hone their skills in a lively but low-risk setting,” said a member of the Laboratory’s hazardous-devices team. Currently, line crews have to suit up in protective clothing, employ elaborate safety procedures, and sometimes completely shut off the power before inspecting a power line. It can be difficult, time-consuming, and often dangerous work. Researchers have invented a robot which could change the way power lines are inspected — providing a safer and more cost-effective alternative. Fully autonomous weapons would go a step beyond existing remote-controlled drones as they would be able to select and engage targets without human intervention. Although these weapons do not exist yet, the rapid movement of technology from human “in-the-loop” weapons systems toward “out-of-the-loop” systems is attracting international attention and concern. Countries should retain meaningful human control over weapons systems and ban fully autonomous weapons, also known as “killer robots,” Human Rights Watch and the Harvard Law School International Human Rights Clinic said in a new report. The concept of meaningful human control will be a centerpiece of deliberations at a week-long multilateral meeting on the weapons, opening 11 April 2016, at the United Nations in Geneva. At the Pentagon nowadays, you are starting to see robots everywhere. They dispose of bombs, and throw out the occasional first pitch. They help Marines improve their target shooting. And, if they are human-robot teams that entered last year’s DARPA Robotic Challenged Finals, they drive vehicles, use tools, open doors, climb stairs, and do all sorts of other things. Now another robot — one designed and built by the Defense Advanced Research Projects Agency (DARPA) — happens to be the very first robot warship. In emergencies, people may trust robots too much for their own safety, a new study suggests. In a mock building fire, test subjects followed instructions from an “Emergency Guide Robot” even after the machine had proven itself unreliable — and after some participants were told that robot had broken down. DARPA’s Fast Lightweight Autonomy (FLA) technologies could be useful in addressing a pressing surveillance shortfall. Military teams patrolling dangerous overseas urban environments, and rescue teams responding to disasters such as earthquakes or floods, currently can use remotely piloted unmanned aerial vehicles (UAVs) to provide a bird’s-eye view of the situation, but to know what is going on inside an unstable building or a threatening indoor space often requires physical entry, which can put troops or civilian response teams in danger.